Food and nutrition is a greatly under utilized source of medicine and it is essential to look at nutrition and diet when learning to manage or treat any mental health condition. Said simply “food affects mood”. The food we eat impacts the production of neurotransmitters in the brain which in turn influences our moods that then contribute to our brain detecting the signal, the ‘desire’ for certain food. Neurotransmitters are the mechanism by which the body regulates emotion. Neurotransmitters are brain chemicals that communicate information throughout our brain and body. They relay signals between nerve cells, called “neurons.” The brain uses neurotransmitters to tell your heart to beat, your lungs to breathe, and your stomach to digest. They can also affect mood, sleep, concentration, weight, and can cause adverse symptoms when they are out of balance. Neurotransmitters can be depleted and when they are, we experience a range of mental health symptoms. They can be depleted many ways. It is estimated that approximately that 86% of us have less than ideal neurotransmitter levels. Stress, poor diet, neurotoxins, genetic predisposition, drugs (prescription and recreational), alcohol and caffeine usage can cause these levels to become out of whack. Interestingly just like an accelerator and brake pedal, there are two kinds of neurotransmitters; INHIBITORY and EXCITATORY. 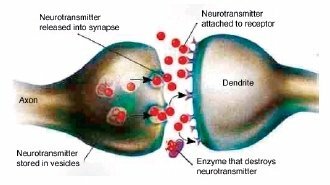 Excitatory neurotransmitters are exactly what you would call exciting – they are what stimulate the brain. Those that calm the brain and help create balance are called inhibitory. Inhibitory neurotransmitters balance mood and are easily depleted when the excitatory neurotransmitters are overactive. SEROTONIN is an inhibitory neurotransmitter – which means that it does not stimulate the brain. Adequate amounts of serotonin are necessary for a stable mood and to balance any excessive excitatory (stimulating) neurotransmitter firing in the brain. If you use stimulant medications or caffeine in your daily regimen – it can cause a depletion of serotonin over time. Serotonin also regulates many other processes such as carbohydrate cravings, sleep cycle, pain control and appropriate digestion. Low serotonin levels are also associated with decreased immune system function. GABA is an inhibitory neurotransmitter that is often referred to as “nature’s VALIUM-like substance”. When GABA is out of range (high or low excretion values), it is likely that an excitatory neurotransmitter is firing too often in the brain. GABA will be sent out to attempt to balance this stimulating over-firing. DOPAMINE is a special neurotransmitter because it is considered to be both excitatory and inhibitory. Dopamine helps with depression as well as focus, which you will read about in the excitatory section. DOPAMINE is our main focus neurotransmitter. When dopamine is either elevated or low – we can have focus issues such as not remembering where we put our keys, forgetting what a paragraph said when we just finished reading it or simply daydreaming and not being able to stay on task. Dopamine is also responsible for our drive or desire to get things done – or motivation. Stimulants such as medications for ADD/ADHD and caffeine cause dopamine to be pushed into the synapse so that focus is improved. Unfortunately, stimulating dopamine consistently can cause a depletion of dopamine over time. 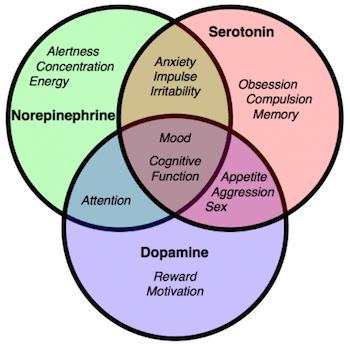 NOREPINEPHRINE is an excitatory neurotransmitter that is responsible for stimulatory processes in the body. Norepinephrine helps to make epinephrine as well. This neurotransmitter can cause ANXIETY at elevated excretion levels as well as some “MOOD DAMPENING” effects. Low levels of norepinephrine are associated with LOW ENERGY, DECREASED FOCUS ability and sleep cycle problems. EPINEPHRINE is an excitatory neurotransmitter that is reflective of stress. This neurotransmitter will often be elevated when ADHD like symptoms are present. Long term STRESS or INSOMNIA can cause epinephrine levels to be depleted (low). Epinephrine also regulates HEART RATE and BLOOD PRESSURE. Although there are many neurotransmitters involved in the experience of mood and the regulation of affect or emotion, there is one neurotransmitter in particular that features significantly in understanding the relationship between food and mood. Serotonin is the neurotransmitter responsible for feeling calm and relaxed and for experiencing a sense of well-being. We also need Serotonin in good supply for a restful night’s sleep. Serotonin is formed in the brain from the amino acid tryptophan after we eat carbohydrates. While some carbohydrate food intake is needed to keep normal serotonin production, the foods that lead to the greatest serotonin production–starches and sugars–need to be eaten in moderation in order to control body weight and diabetes risk. Many people today crave starches, such as bread and potatoes, and sugary foods, leading to excessive intake. This eating pattern, often called comfort-food craving, may be driven by high levels of chronic stress. Chronic stress leads to the production of excess stress hormones in the body, primarily cortisol. This becomes a problem, When cortisol is produced, because it inhibits serotonin production. This means low serotonin levels will cause us to feel more anxious and depressed and sleep is disrupted. We might even be unable to sleep at all. This causes a vicious cycle; when sleep is disturbed due to low serotonin, cortisol levels are increased and serotonin levels are further depleted. If this cycle is not stalled, stopped or corrected it contributes to the development of insulin resistance and weight gain. Most of us have occasionally experienced increased cravings for comfort foods during times of stress or when feeling depressed or anxious. However, under chronic stress, many people experience intense starch and sugar cravings daily. Not giving in to these cravings is almost impossible, since there is a strong physiological underpinning to them. Stress management is key to reducing these food cravings. It is sometimes difficult to avoid stress. There are many herbs which can help with a disturbed stress response. My favorite go to herb for calming a stress response is Withania. It is very effective in practice however their is significant debate and hypothesizing as to why it works so well. It seems to effect the HPA axis and cortisol levels however the effect is not direct. My favorite go to herb for disturbed sleep is Valerian by others find Valerian more effective when it is combined with Hops, Passionflower and even Kava. Valerian appears have an effect due to increasing the amount of GABA being released from nerve endings in quantities sufficient to produce a sedative effect. Some natural remedies, such as extracts from the bark of the Phellodendron amurense and Magnolia officinalis trees, have been shown to control anxiety and the symptoms associated with it and reduce stress-related food cravings. MY favorite go to supplement for disturbed sleep and stress response is the dietary supplement 5-HTP (5-hydroxytryptophan). This has the helpful effect of reducing stress-related food cravings as well. In the body, the essential amino acid tryptophan is converted to 5-HTP, which is then converted to serotonin. Taking 5-HTP can enhance serotonin synthesis, aiding the body in sleep, reducing mood disorders, and promoting weight loss. The more serotonin levels are maintained, the fewer the cravings for sweets and carbohydrates. Doses range from 50 mg to 300 mg per day. If you are on antidepressants, make sure that you consult your health care professional before using 5-HTP. As always, balance and moderation in all things is the best medicine. Getting good sleep, nutrition and regular moderate exercise helps manage stress and reduce those crazy cravings for carbohydrates. Also, many thanms ffor allowing for me to comment!